Automotive Lighting Market size was valued at around USD 30 billion in 2017 and will grow at a CAGR of over 5% from 2018 to 2024. Growing automobile production to address the increasing consumer demand is driving the automotive lighting market. Modern automobiles deploy technically-advanced systems such as driving assistance and lighting control systems. The development and integration of the LED and laser technology into modern vehicles will create growth opportunities for the industry. The introduction of government regulations, such as ECE regulations, by the European Commission on the manufacturing of automotive & general lighting products to control the environmental effects and low chemical use, promotes the utilization of modern lighting technology. Eco-friendly and sustainable product development initiatives adopted by the major manufacturers are propelling the automotive lighting market growth. High LED costs and continuously changing raw material prices are restraining the automotive lighting market growth. Prices of LED-based products are high as compared to the conventional xenon and halogen products. Fluctuations in the component prices pose difficulties to the manufacturers and result in low-quality production. In the automotive lighting market, the LED technology segment is expected to grow at over 7% CAGR from 2018 to 2024. Lighting in automobiles is a major application in the global LED market, which is developing rapidly with other niche industrial LED products. Traditionally, LED technology was used in rear lighting in vehicles; however, due to advanced features such as better lighting systems and power efficiency, they are being increasingly used as front lighting or headlamps. Countries including China, Japan, and India are increasingly integrating LEDs into the interior automotive lighting and rear position lamp segments, driving the automotive lighting market growth. In addition, the lighting system manufacturers in China are rapidly making progress in making vehicles technologically-advanced by developing advanced technologies such as Daylight Running Lights (DRLs) and many are using standard LEDs for the DRL products. LED fog lights and headlights offer significant growth opportunities to the automotive lighting market due to the growing focus on headlights including turn signal lights, H/L beams, and DRLs. To serve this purpose, manufacturers are continuously focusing on partnering with OEMs to design and develop LED chips based on different purposes. For instance, the customers in the U.S. require Thin Film Flip Chip solutions while customers in Japan and Taiwan favor Flip Chip LEDs. In the automotive lighting market, the passenger car segment was valued at over USD 20 billion in 2017, thus dominating the industry in terms of revenue share. Passenger cars majorly deploy the lighting systems due to their incorporation into interior & exterior, side, rear, and front-lighting applications. These vehicles cover the largest market share due to high consumption across the globe and the integration of LED-based lights into lighting systems. The modern lights offer benefits to the passenger cars such as enhanced performance, design flexibility, and longer product lifetime. Manufacturers offer highly efficient lamps and lights that support the road safety features in passenger vehicles. LED and laser-based lights improve headlamp illumination and support their integration into advanced systems such as AFS and bend lighting systems. In the U.S., a high demand for passenger cars, supportive government initiatives, R&D activities for the development of the lightweight car components is driving the automotive lighting market growth. In addition, the increasing utilization of commercial vehicles in the U.S. deploying powerful fog lights, halogen headlamps, and night safety lighting systems further contributes to the automotive lighting market growth. These vehicles majorly deploy product ranges that offer robust flexibility and longer lifetime. The interior lighting application in automotive lighting market is expected to grow at 7.1% CAGR from 2018 to 2024. The interior lighting solutions in the automotive lighting market are gaining traction due to the implementation of enhanced lighting systems in the high-end and modern passenger cars that offer ambient and mood lighting features. Earlier, these systems were deployed in luxury cars only; however, due to the high demand, the solutions are being implemented in the passenger & commercial vehicles. The lighting solutions are utilized for providing driver safety and ensuring a clear visibility. The interior lighting systems have a high demand in the North American and European countries due to the presence of major OEMs such as BMW, Mercedes, and Audi. The U.S. government initiatives to reduce road accidents and enhance the driver safety are creating a demand for the LED-based lighting products. Moreover, advanced front lighting systems are increasingly implemented in the commercial vehicles due to the requirements of robust headlamps in trucks that provide driver safety at nights and in odd driving conditions, further contributing to the automotive lighting market growth. 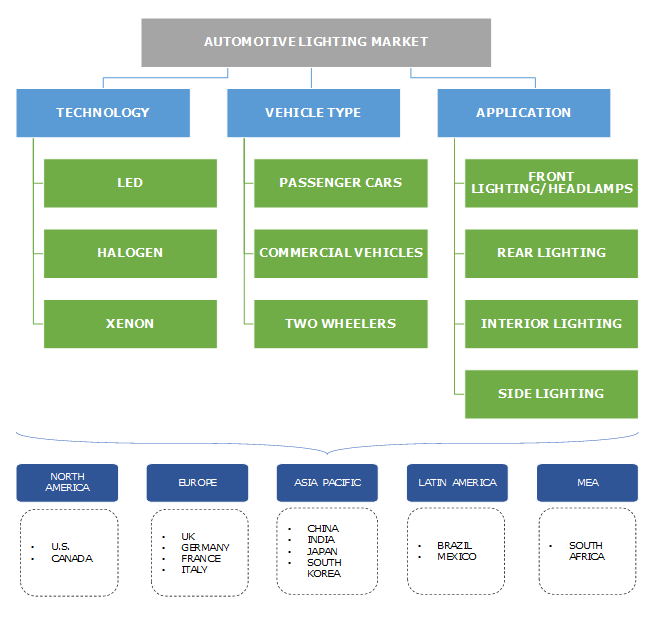 The Asia Pacific automotive lighting market dominates the overall industry in terms of revenue share and is expected to grow at over 6% CAGR over the forecast timeline. The region is witnessing a rapid growth in the automotive lighting market due to the presence of several key manufacturers in China, Japan, and South Korea. The increasing demand for Asian-made automotive components in the U.S. and European region drives the industry demand. The dominance of South Korea in the Asia Pacific market is on a rise due to the increased manufacturing, sales, and export activities. The presence of major automotive producers, such as Hyundai, Kia Motors, and SsangYong Motors, accounts for a high growth in the country. Additionally, government initiatives and regulations in Japan to control the environmental hazards and use of mercury are creating a high demand for advanced lighting solutions. The U.S. automotive lighting market is expected to grow at 3.5% CAGR. Consumers in the U.S. possess high spending capability, leading to the growing sales of vehicles with intelligent driving and lighting systems. OEMs in the region deploy products imported from the Asian countries due to the low prices and high quality. In Europe, the regulation on DRLs lead to a high demand for automotive LED lighting. The rising demand and advanced technologies are encouraging manufacturers to lower the production costs and improve the yield. 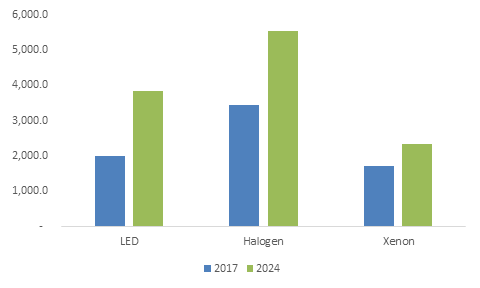 Moreover, increasing R&D in the technology has increased the successful integration of LEDs into the automotive exterior light, contributing to the automotive lighting market growth. Prominent industry participants in the automotive lighting market include Magneti Marelli S.p.A., Osram Group, Valeo, Hyundai MOBIS, HELLA GmbH & Co. KGaA, General Electric, Varroc, Koninklijke Philips N.V., and Samsung Electronics Co. Ltd. The automotive lighting market is characterized by the presence of a number of small and big players. The key industry participants are adopting expansion, partnerships, and joint venture strategies to offer advanced solutions to the automotive manufacturers. For instance, in October 2016, HELLA GmbH & Co. KGaA announced its partnership with Covestro for developing new designs for vehicle lighting systems comprising the front & rear lighting products. In another instance, in June 2017, Magneti Marelli announced the establishment of its new automotive lighting production plant in China for the production of LED headlamps and rear lamps. Lighting systems are a vital component in the automotive vehicles, playing an important role in the automotive safety. A vehicle consists of different lighting systems to enhance the visibility during odd conditions, offering illumination to drivers, helping pedestrians and other vehicle drivers to identify a vehicle’s position & movement, and enhancing the aesthetic looks to various parts of the vehicle. New technologies, such as LED, OLED, and laser, are driving the rapid change in the automotive lighting market. These technologies offer significant growth potential; however, delivering and developing such solutions are complex. The industry dynamics are characterized by intense competition with the presence of large enterprises’ having production plants in the major markets, efficient distribution channels, and sales force strength. The established players and OEMs in the automotive lighting marketplace possess significant purchasing power, allowing them to purchase lighting systems in large quantities, negotiating favorable pricing, warranty, and other terms with vendors. Furthermore, the manufacturers aim at offering technically-developed supplies and efficient systems that fulfill the long product life requirement and safety compliant systems. Another trend among the manufacturers is the green & sustainable development that reduces the carbon footprint and improves the operational processes. The key strategies undertaken by the major manufacturers in the automotive lighting market include the expansion of the production capacities by setting up new production plants and the expansion of the existing plants due to the rising automotive production across various regions; partnering with the design companies with an aim to develop new designs for the vehicle lighting systems comprising the front, rear, side, and interior lighting systems; and investments in R&D to develop smart systems for autonomous & semi-autonomous driving applications, development of Advanced Frontlighting Systems (AFS), OLED, and laser technologies.